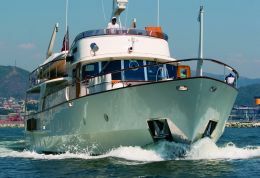 Shyraga is a classic 1950's motoryacht, twenty-nine metres LOA with a six metre beam and a tonnage of about 122 tons. The lines are harmonious and well proportioned with a characteristic canoe stern, the work of Laurent Giles. This English designer, well known at the time for his innovative sailboats, superbly interpreted the Italian customer's request for an elegant, tough, seakindly hull. 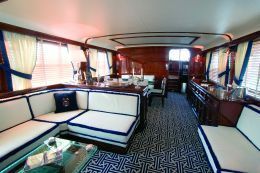 It was such a success that after Shyraga's launch in 1954 he had a considerable increase in similar commissions, all for large motoryachts. The vessel was built at the German shipyard Abeking & Rasmussen, where steel was the standard building material. The carefulness of the work process extended to a special type of zincing applied overall which, though it upped the price more than a little, also meant that all the structures could be preserved intact for a long time, thus considerably reducing maintenance costs. Suitable techniques were employed for heat and sound insulation of the interiors, for example the creation of cavities between the decks, and a special layout of the tanks between engine room and cabins, not to mention the use of sound- absorbing materials. 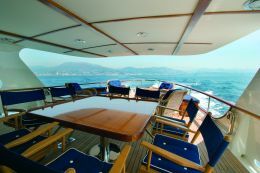 With the crew's and captain's quarters forward, in accordance with the rational rules of the day, and the spacious cabins for owner and guests aft of the engine room, Shyraga was a comfortable, luxurious yacht, at home throughout the Mediterranean. 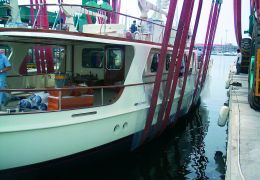 She had several owners, including the industrialist Piaggio, which resulted in various name changes, but the philosophy of the yacht didn't change, nor was her original fitting out ever tampered with. It was only in 1986 that Shyraga underwent a first extensive refit, at the CBI Navi yards: the flying bridge was elongated, both to make up for the space required by the new tenders and electric davits, and to better protect the external living area on the main deck. 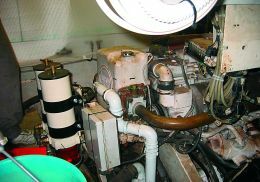 Then two more powerful generator units were installed, the galley was renovated, Vosper stabilisers were added, two GN engines replaced the original Foden FDs and the yacht was equipped with air conditioning, electronic navigation systems and a new mast to house the various aerials necessary. All in all, more than a year's work. Her range was now 3000 miles, practically doubled, and her cruising speed is between 11 and 12 knots. She underwent a further series of modifications during her American period in the late 1990's, mainly to do with the furnishings. An interior designer was engaged - Maria Nevelson of Philadelphia - who introduced various hints of Art Deco though in a fairly personal interpretation. The years the yacht spent in Florida at the turn of the century were not the best for Shyraga: neglect, inadequate maintenance, a negative biorhythm let's say, but which was inevitably followed by a positive one. In 2004, with the mediation of Mortola Yacht & Ship Brokers Management, the yacht was purchased by the present owner at Fort Lauderdale. This may sound like a normal operation: a broker finds a boat, the owner likes it and buys it. But this case was rather different, not a wholly fortuitous occurrence but rather the epilogue to a waiting period of nearly twenty years, which had begun with a fleeting encounter in 1986, a real youthful coup de foudre which triggered a desire in the present owner to have precisely that vessel, and all courses cross sooner or later.. 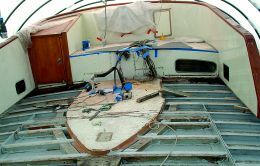 The yacht's arrival at La Spezia aboard a cargo vessel on 6th January 2005 and transfer under her own engine power to the Alfayachts Yard in Sestri Ponente, may be defined as act one of her rebirth. 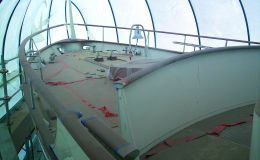 Under the supervision of the Mortola Brokers Management Division an initial series of works was decided on, indispensable in order to sail safely and not miss the cruising season, but also preliminary to the definitive restoration. 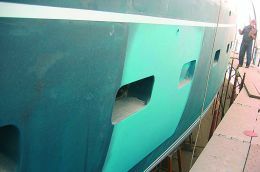 Sandblasting of the hull was an important moment for checking the structures, which turned out to be in good condition, and it was followed by a complete repaint cycle, replacement of the non-functioning Oman units with two 33 kW Kohlers, and overhauling of the engines. 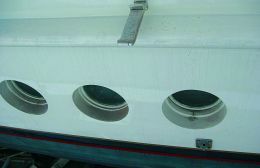 The main body of work was resumed the next autumn with structural modification of the bow: the hawsehole, which is to say the anchor housing, was redone in stainless steel on both sides, to a new design which allows the chain to run more smoothly and puts less strain on the winch, which itself was completely overhauled while maintaining its original structure and appearance. The chain is now in stainless steel, six cable lengths on one anchor and five on the other: these are heavy Mason anchors in steel, specially imported from New Zealand. The works carried out forward also involved the crew's quarters, two double cabins plus the captain's, which were dismantled and redone with furnishing improvements. And then the installation of a powerful hydraulic bow-thruster: a captain's skill is sometimes of no avail in crowded Mediterranean ports! The engine room too underwent extensive interventions: total dismantling, sandblasting of sheet metal, renovation of soundproofing and the mounting of new engines with invertors, shafts and propellers. The old GM engines were replaced by two 331 kW at 1800 rpm MAN D2876 NE403, which is to say slow engines with low consumption, but thanks to optimisation they give the vessel a little more range and speed: now she touches 13 knots maximum with a cruising speed of 11.5-12 knots. Of course all the tubing was replaced and all the service plant, including the forced aeration system which has supplementary intakes and the extractor exhausts on the aerial mast. The new engines have electronic controls while the steering gear is hydraulic with separate circuits for indoor and flying bridge. Obviously the navigational instrumentation is appropriate to the vessel's class (Shyraga recently obtained RINA 100-A1) and a satellite TV system has been installed. The air conditioning has been completely renewed to allow comfortable sailing in all seasons, while the Vosper anti-roll system has been thoroughly overhauled component by component. The powerful desalination plant is also new. The cabin and saloon furnishings have been taken down to the wood, dismantled and restored, giving the old mahogany the splendour it once had. In this phase of the restoration consultancy was sought from a name well known in the field of interiors and also the owner's friend, the Florentine architect Bonini, to harmonise the elements of a style which is in a word composite but with strong references to early Art Deco, such as the lamps and the grating with stylised palm beneath the handrail in the wheelhouse. Another noteworthy aspect is the new chroming of the elements, precisely to highlight the typical contrasts of the style: bare metal, dark, light, no affectedness. 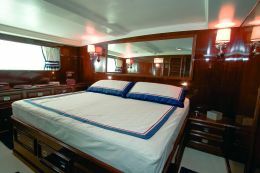 The lower deck houses the owner's cabin amidships with private bathroom, and two guest cabins with beds set out in an L shape and a shared bathroom. 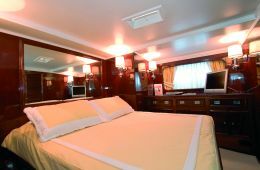 The VIP cabin is aft and a fifth guest cabin is forward of the engine room: it was the vessel's old fumoir, with its own external bathroom serving as a day toilet. Radical works in the galley too where the precious Calacatta marble worktops match perfectly with the period mahogany and the stainless steel of functional Miele appliances. 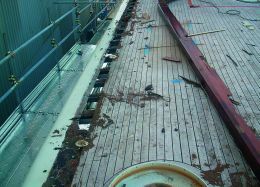 The rubber on the deck was replaced, as was the support plate of the hand top rail, on the bulwark, with one in stainless steel in order to preclude rust blemishes. The glass prisms are the originals while the downtakes, which weigh 20 kilos each, were cast in brass on the original model and then chrome plated. 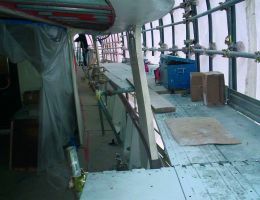 The flying bridge was subject to more radical works, such as replacement of the metal sheets forming the covering of the gangways and complete renovation of the teak. 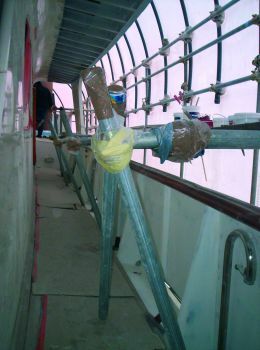 The rail was given an opening in correspondence to the main tender to aid its manoeuvring with the davits that have also been fully renovated. The second tender, a 14 foot Nautica from the USA, has only recently come into service. With Shyraga's skipper Marin Duka as our competent guide, Superyacht visited and photographed the boat at AlfayachtsYard last July, just before her delivery. 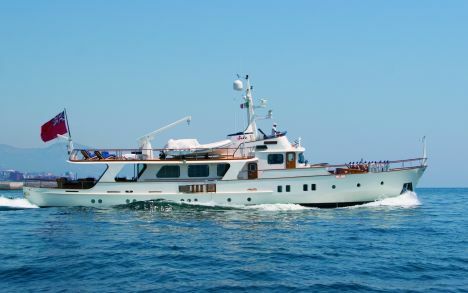 Though the Sestri Ponente skyline isn't exactly the ideal backdrop for a yacht of her class, the photos show a timeless elegance, a wave that opens up at the bow and closes harmoniously at the stern. Sailing without vibrations or shudders. 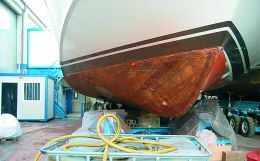 Shyraga will be back here in autumn, after summer cruises, for the last fine-tuning and the works under guarantee.